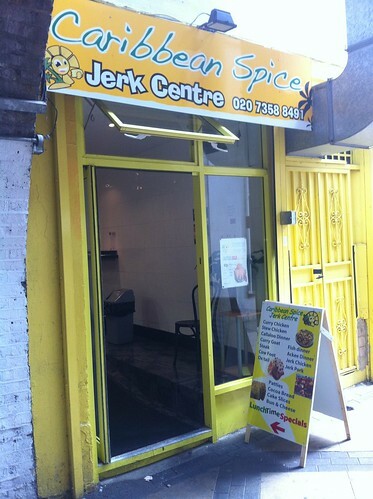 a rather unusual chinaman: Caribbean Spice Jerk Center, the home of Jerk. Caribbean Spice Jerk Center, the home of Jerk. Walk down the alleyway where the Caribbean Spice Jerk center is located, and I guarantee you will walk straight past it without even a second glance. Hidden away under the arches of Peckham railway station is the incredibly unassuming but startlingly deceiving little Jerk takeaway. I was headed here for one thing and one thing only, the jerk pork. I had just moved into my Peckham flat, and after surveying Food Stories for the local treats, an article mentioning her favourite jerk emporium had me salivating. I had to have it. Behind the counter stands a short Caribbean woman, casually conversing in patois with most of her clientele and it actually takes a little while for her to realise I am there. Once my order of Jerk pork is taken, she disappears into her kitchen out the back to carefully assemble my box of meat and rice. Time passes. A lot of time actually, enough time for me to try and make head or tail of every other item on the menu. Fancy some breadfruit or festival with your meal? Maybe a dinner of callaloo with a side of bun and cheese? The menu was intriguing enough to while away the time before the cheerful woman arrives back at the counter. "I gave you more sauce. And made it spicy" she proclaimed. I felt like the luckiest guy in the world. 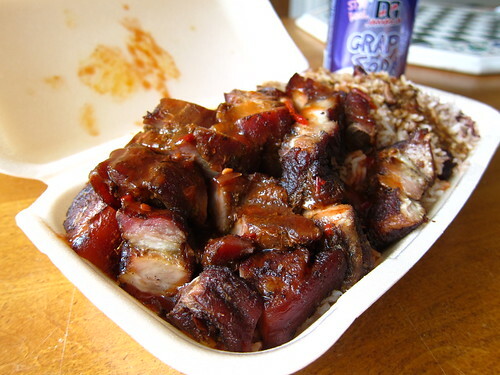 I returned to my flat and started to tuck into the monumental mound of jerk pork belly, rice & peas. Each mouthful was so tender and the meat just broke apart. The fatty belly just melted in your mouth, whilst the zing of habanero lit up your lips. Each mouthful of rice was delicate, fluffy and flavoursome. Basically, it was all awesome. Whenever I hit the bits of rice which had been graced with that little bit of extra oxtail gravy, I would close my eyes a little and smile. This was good jerk, no no, the best. You may not be thankful enough to live as close to Caribbean Spice as I do, but it is only 10 minutes on the train from London Bridge, and people have been known to stop by Peckham Rye station just for a portion of that jerk pork. At £7 for a large portion (which was enough for lunch the next day as well), it's great value. I can't say I could face eating that much gelatinous pork every day, but I fully intend to try and make my way through the other jerk options on the menu. And you never know, one day I'll be ordering some callaloo and breadfruit as well. Amazing, isn't it? The jerk pork AND the time they take to warm it up in the microwave. Astonishing. Worth waiting for though! I MUST EAT HERE SOON! @ Helen - One of the few places I don't mind waiting one jot. Loove this jerk pork, def worth the trek to Pekham!! Looking forward to reading your top 5's one day! Great post, I am on the hunt for London food. I hit the smoke in a few weeks! Your site is a great help. I must get a blog together. There is a lot of nice food here in Devon. Most of it I cook my self.Plenty of foraging.Alas not much of the Jamacian food we all love. That looks very delicious. I Think Caribbean Spice Jerk Center will be a great place to hang out and eat. They have changed their name to ddk jerk centre but still has the same cook!! And some prices have gone down to help people afford good food!! It is hidden but if your coming out off Peckham rye train station go down the ally on your right.! Excellent food!